Pope Francis canonized the first saint in North America -- Junipero Serra -- on Wednesday afternoon at the Basilica of the National Shrine of the Immaculate Conception in Washington, D.C., before a crowd of thousands. Francis celebrated Mass before a large group on a lawn from an altar that had been erected at the east portico of the shrine for this historic occasion. At the Mass, the Rev. Ken Lavarone from San Diego, who was instrumental in pushing for Serra's canonization, presented the story of the 18th-century priest, detailing his missionary work in California and Mexico and laying the rationale for elevating him to sainthood. The gathered crowd cheered and clapped when Serra was officially named a saint. "Today we remember one of those witnesses who testified to the joy of the Gospel in these lands, Father Junípero Serra," Francis said, in Spanish, according to the official translation of his homily. "He was the embodiment of 'a Church which goes forth', a Church which sets out to bring everywhere the reconciling tenderness of God. Junípero Serra left his native land and its way of life. He was excited about blazing trails, going forth to meet many people, learning and valuing their particular customs and ways of life. He learned how to bring to birth and nurture God’s life in the faces of everyone he met; he made them his brothers and sisters. Junípero sought to defend the dignity of the native community, to protect it from those who had mistreated and abused it. Mistreatment and wrongs which today still trouble us, especially because of the hurt which they cause in the lives of many people." The canonization ceremony was not without controversy. To Francis, Serra was one of the United States’ founding fathers, a missionary who brought the Gospel to the New World. 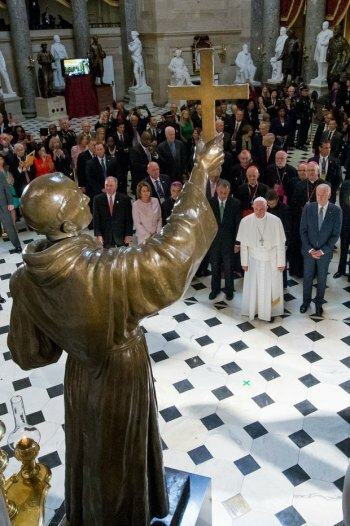 Pope Francis in front of a sculpture of Junipero Serra, Sept. 24, 2015. But to Valentin Lopez, the chairman of the Amah Mutsun Tribal Band of the Costanoan/Ohlone Indians, Serra was the architect of a brutal mission system that enslaved and terrorized Lopez’s ancestors in California. This summer, Francis issued a broad apology for the church's treatment of indigenous populations. And Johyn Reyno, a Lakota Indian who lives in Kansas City, Missouri, and who attended the Mass, defended Serra's canonization. "We've let too much of the secular society bring us to a place where we are no longer spiritual brothers and sisters," he said. "I think really honestly to have somebody give over their entire life, go to another continent and decide that they're going to live a ministry as a missionary, you're not giving over just a little bit. That's not a 40-hour job. And some people get focused on negative things rather than knowing that colonialism and Christianity aren't the same thing." The Mass drew dignitaries among them Vice President Joe Biden and presidential candidate Jeb Bush. At least two Supreme Court justices were in attendance, Chief Justice John Roberts and Sonia Sotomayor. "Today feels amazing," said John Liston, executive director of Serra International, a international organization founded in 1935 that promotes priesthood and religious life within the Roman Catholic Church. 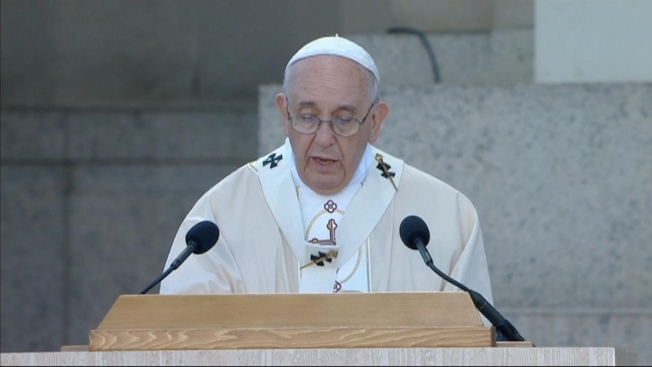 "It’s the first canonization to take place on North American soil and it’s the patron of our organization. He was the spiritual father of western California and we’re very proud to bear his name." American Catholics are committed to a “truly tolerant and inclusive” society in which individual rights must be protected, he said. The first canonization on U.S. soil comes with controversy, News4's Aaron Gilchrist reports. 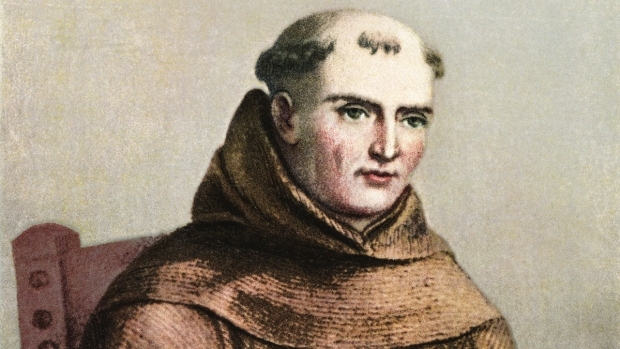 Pope Francis has been accused of hypocrisy for planning to canonize Franciscan missionary Junipero Serra after apologizing for the “grave sins of colonialism,” a charge leveled by some Native Americans. 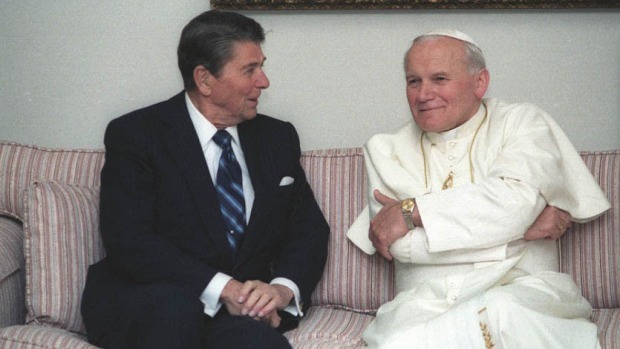 He greeted crowds in downtown Washington, D.C., riding in the popemobile along a parade route around the National Mall, and afterward held a prayer service at the Cathedral of St. Matthew the Apostle with about 300 American bishops. Emily Click, the assistant dean for ministry studies and field education at Harvard Divinity School, was in the crowd on the White House lawn. One of the highlights for her was the spirit of the crowd, she said. "I could just feel the degree to which people really looked to him as a hopeful presence," Click said. "There were little children who were severely disabled and there were elderly people. You saw people who probably don't stand very often getting out of their chairs and standing, I think out of respect." Francis was greeted at the basilica by about 3,600 American seminarians and men and women novices. Cardinal Donald W. Wuerl and Monsignor Walter R. Rossi, the basilica's rector, accompanied Francis to the Blessed Sacrament Chapel for private prayer. 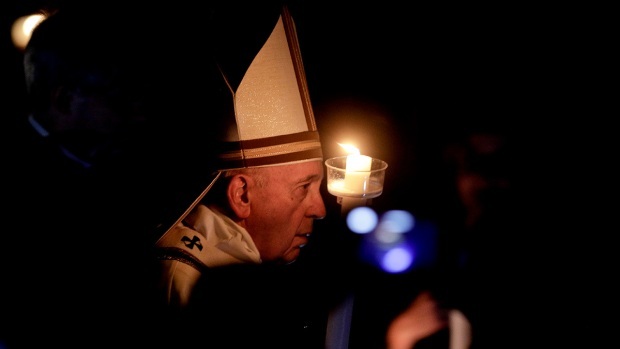 Francis celebrated the Mass on the steps of the east side of the basilica before about 25,000. The Mass and homily were be in Spanish. Waiting for him before the Mass, 30-year-old Dari Herrera, a family case manager from Gaithersville, Maryland, at a not-profit social services agency, said she liked Francis’ naturalness and determination to forgo the symbols of privilege. 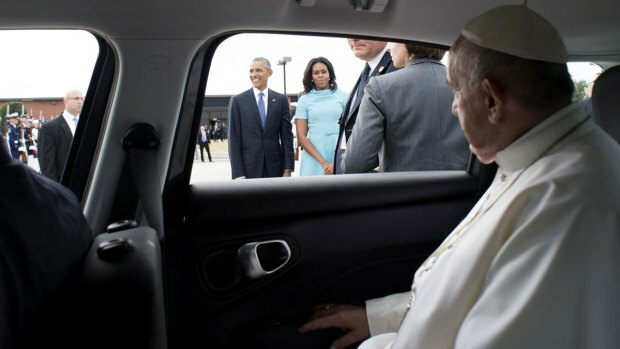 “He does things the other popes didn’t do,” she said. “He’s so natural and so — he didn’t even want to go in the limousine yesterday." As a Latino, who is speaking out for the poor and for immigrants, he sends a message especially at a time of divisive debates over immigration, she said. Twenty-one-year Nallely Arriaga of Upper Marlboro, Maryland, said she especially liked the steps Francis has taken to welcome Catholics back to the church, giving priests the authority for a year to forgive women who had had abortions, for example. “I think that would open a lot of doors for women who have actually aborted to not feel guilty and to get into church and feel closer to God,” she said. The pope said that Serra defended Native Americans against abuses by colonizers and that his writings showed respect for indigenous people and their ways. Teresa Berger, a professor of Catholic theology at Yale University’s Divinity School said that a number of factors could have drawn Francis’ attention to Serra, among them Francis’ knowledge of the missionary work in the Americas and his devotion to St. Francis. Francis has been accused of hypocrisy for planning to canonize Serra after apologizing in June during a tour of South America for the “grave sins of colonialism,” a charge leveled by some Native Americans. “No, they are just seeing different parts of a complicated legacy,” she said. Harvard Divinity School Professor Francis X. Clooney said that any choice for sainthood would likely be criticized. Lopez and other Native American leaders said that ceremony would signal that the Roman Catholic Church still treated Native Americans as pagans and savages. Little has changed since official papal documents or bulls of the 15th century considered indigenous people to be pagans, savages and heathens, he said. In defending the beating of Native Americans, Serra wrote in 1780: "That spiritual fathers should punish their sons, the Indians, with blows appears to be as old as the conquest of the Americas; so general in fact that the saints do not seem to be any exception to the rule." Lopez wrote this month in a letter to Francis that Indians were never told that once baptized they were be confined involuntarily at the missions and forced to labor for clergy and soldiers. They were captured violently, enslaved, tortured and raped; their unhealthy diet and squalid living quarters resulted in the deaths of an estimated 150,000 California Indians at the missions. “How the Catholic Church and you, Holy Father, can consider Serra’s actions to be holy, sacred or saintly is incomprehensible to our Tribe,” he wrote. The first saint to be canonized in the United States, Miguel Jose Serra was born in 1713 on the island of Majorca off the coast of Spain. He was influenced at an early age by St. Francis, and when he decided to enter the priesthood choose the name Junipero after one of St. Francis' companions. Serra set sail from Majorca in 1749 and after almost two months at sea, he and other missionaries arrived in Puerto Rico. He traveled on to Veracruz, Mexico, walked 250 miles to Mexico City and eventually made his way to San Diego. He founded nine missions in California before dying in Carmel in 1784. He is buried under the sanctuary floor of the mission church, Mission San Carlos Borromeo de Carmelo. In California, many streets, highways, trails, schools and monuments bear his name. His statue is one of two representing California in the U.S. Capitol’s National Statuary Hall along with one of former president and California Gov. Ronald Reagan. Its presence has come under debate as well. Some Californians want to replace him with astronaut Sally Ride, a proposal postponed until after the pope's visit. Clooney said that the process to sainthood was typically a long one with multiple stages. A religious figure is usually identified by a local church, and when support grows, messages begin to be relayed to the Vatican. Because the path to sainthood is complicated, Clooney said that the decision to canonize Serra probably preceded Francis’s papacy. But Berger said she thought it was Francis’ decision to move forward with the canonization during this trip. Serra was made “blessed” — the stage before sainthood — in 1988 by Pope John Paul II, and could have remained at that stage indefinitely. The Vatican has recognized only one miracle performed by Serra, another controversial decision: A nun in St. Louis was cured of lupus after praying to him. Editor's Note: An earlier version of this article mistakenly said that Pope Francis is a Franciscan. He is the first Jesuit pope.